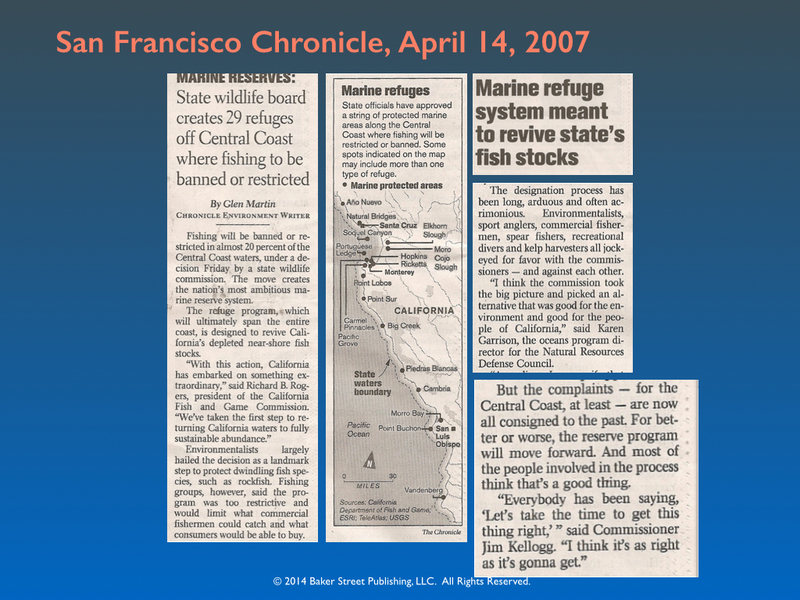 In 1999 California passed the Marine Life Protection Act. The Act mandated the design and implementation of a network of Marine Protected Areas (MPAs) along the length of the California coast by 2011. The design task was assigned to the Department of Fish and Game. The effort stalled after two false starts and State budgets were exhausted. The project was restarted under the terms of a Memorandum of Understanding between the State and the Resource Legacy Fund, a large non-profit. The Memorandum specified creation of a Blue-Ribbon Task force to oversee design and make a final recommendation to the California Fish and Game Commission. The pr0ject was completed on time by an effort that involved fisherman, conservationists, and scientists statewide. The marine reserve network is being implemented. Marine resource management decisions are complicated: organizationally and scientifically. This kind of decision requires careful organization, effective process, the right people, and appropriate management science tools. This slide deck from a 2014 INFORMS presentation provides an overview of project organization and the process that was followed by decision makers, stakeholders, and scientists.